We started the session looking back over two female images that stood out to us from last week. 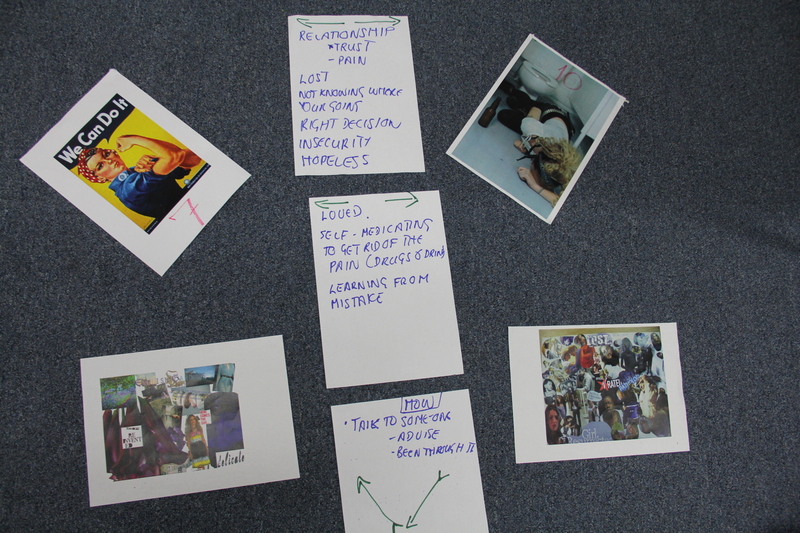 Anne-Marie put the images on the and asked us to think about what could make a girl go from one image to another. She taught us words like ’empowerment’ – to take control of your life, to take up opportunities, education, healthy ways of thinking so that you have more choice and ways of bettering yourself and ‘disempowerment’ – where you lose control of your hopes, dreams and ability to cope and hand your power over to others or be overpowered. 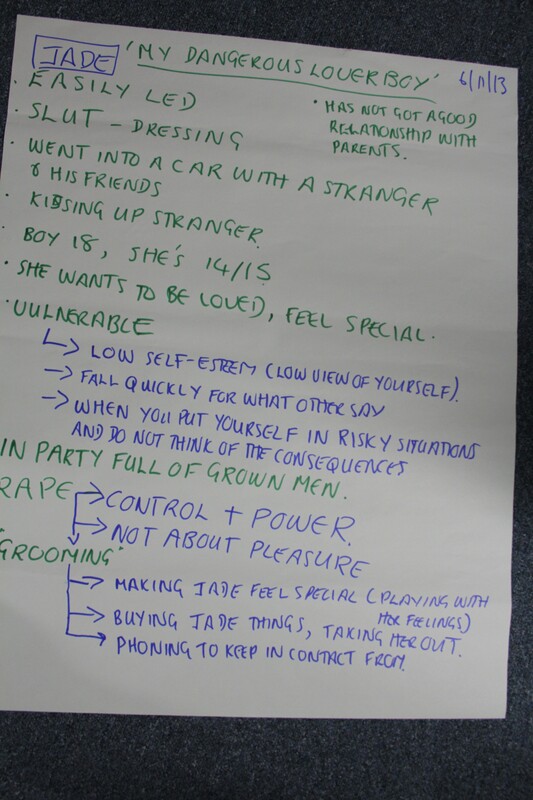 We listed different ideas of what could happen to girls to make them go form a position of ’empowerment’ to ‘disempowerment’ and the other way. We said:- Loss, death, family break-down, drugs and alcohol, bad relationship, being taken advantage off, getting into negative situations, hanging around with the wrong people and more. Some of us said that it like talking about our own lives. W also said about not following certain people, being able to say no and not believing all what boys tell you, having self-belief. Claire Manchester from the Integrated gangs Unit showed us a video called ‘My dangerous lover boy’. This was the first time most of us have met her. She is one of us YOT worker. It became annoying watching 5 mins of the film then stopping to talk about our thoughts and feelings, but managed to give feedback on what we thought and felt. Natalie said next time we should watch the whole film without stopping, as it really annoyed her. Claire then explained that she keeps stopping the film so that we don’t forget our views. We also could not stop talking once we started and we started to challenge each others views. Most of us were sympathetic with the girls situation. Others really got angry with what was happening to her. Gabby thought that she could have read the signs and left the man as soon as he gave her free gifts. That a young girl at the ages of 13 can be groomed for up to 3 years so that the build a trust in the person grooming them, this makes them vulnerable. – how the need to feel special (especially when such needs are not being met at home) can lead girls to a place of vulnerability. Where they will be controlled and over powered to do things that they do not want to do.